The Cosco Elements Loft Bed is perfect for combining sleep, play and organization all in your child’s bedroom. This Loft Bed provides a great solution for optimizing space. Quality built for years of enjoyment, this Loft Bed allows you to take full advantage of even small bedrooms, creating space and providing organization. The Cosco Elements Loft Bed provides easy access for your child, but parents can easily reach in to tuck in your little ones at night. 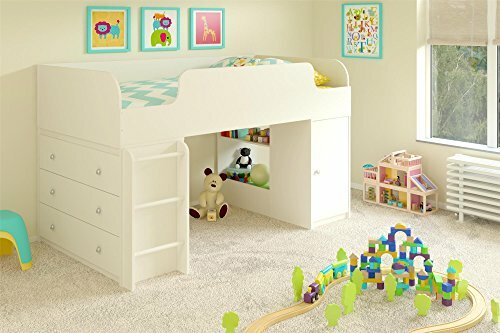 Open area beneath the bed can be used for storage or play. This Loft Bed is built to meet our quality standards for safety and extended use. The contoured guard rail has rounded edges to reduce sharp corners, so kids can sleep, play or study worry free. Loft Bed accomodates a twin size mattress. Assembly is required upon delivery.